I said this before, I'll say it again. I'm so against the NFL pushing the draft back into the late afternoon. It should be an all-day thing, Saturday and Sunday. It shouldn't start at 4pm on Saturday and go until 9pm. Oh and another thing, ESPN on the A-Rod injury piece. Please run as many photos of hip operations as possible. Because that's why I watch sports, so I can get 20 minute segments speaking to a hip surgeon. Yeah. Think Brian Cashman wants that Nick Swisher—Wilson Betemit trade back right about now? So Manny agreed to a much smaller contract than what his 2008 numbers deserve, and T.O has been cut again and has a much smaller contract not in Dallas, but in northern New York. Are you listening Ocho Cinco? Being a "personality" is costing you guys money. Especially in this economy, maybe guys with "personalities" should just chill it for a little while. Tra Thomas, who signed with the Jacksonville Jaguars for 3 years, says he has "a lot left in the tank." Well, Jacksonville sure hopes so. Thomas, who is 34, did perform very well last season, but it should say something that the Eagles were looking to replace him—if he was that good and had so much left in the tank, why were they willing to let him go? If you'll notice the poll I had on the side of the blog, you'll see I didn't even have the option of T.O. going to Buffalo. That's because I didn't imagine T.O. ever agreeing to go to a place like that. Which further means, that T.O. 's options were certainly limited—to go to a small market wen just a week earlier he was in football megacenter-Valhalla of Dallas; we may finishing his career not with a bang, but with a Buffalo whimper. Honestly, how come Byron Leftwich isn't on a roster as a backup QB. What did he do? The guy isn't Joe Montana or anything yes, but he filled in nicely as a backup for the Steelers last year and kept the machine more than rolling for them when Big Ben was out. Why isn't he backing up, say Baltimore's Joe Flacco, or the Giant's Eli Manning? Any team that fancies itself a legitimate Super Bowl contender and only has Troy Smith or David Carr as the potential long-term fill-in should seriously look at this guy. 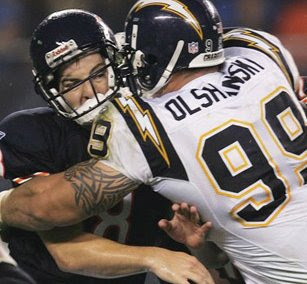 Under the radar free agent signing that will turn out huge: Igor Olshansky signed by the Cowboys to play DE. The man is mule strong and ties up blockers so other guys can make plays. A nice pickup to replace Chris Canty. And lastly, in the ridiculous news of the day, it appears the Chinese are angry at America again. For what, you ask? Democracy? Trade restrictions? No, cheerleading. And some old-time Chinese are upset about it. In an ABC interview, one old man say "we want something with Chinese characteristics, not this garbage...while he was in the stand at the cheerleading event!! Well, if he hates young nubile women cheering—and who would?—then don't go, big guy. But I have a feeling at the next Chinese cheerleading competition, he'll be in the stand,watching and grousing about how awful it is. I can't tell you how happy I am the Cowboys are starting to finally getting rid of some their problems: Pac-Man, TO, Tank Johnson, safety Roy Williams. Kitna is a huge upgrade as a backup over Brad Johnson, who had problems throwing the ball more than 5 yards. They still have a ton of problems, but at least something was done. I wonder about Leftwich as well. He did take a dump in Roger Goodell's lawn or something? No one will touch the guy it seems.